Despite his manic promiscuities and a conspicuous gift for generating catastrophe, the Marquis de Sade was, according to Gray, a happily married man. In 1990 the monstrous Sade’s literary stock rose inestimably. Gallimard, the famous French publishing house, issued a two-volume set of his works in its prestigious series of classics, Bibliothäque de la PlÇiade. 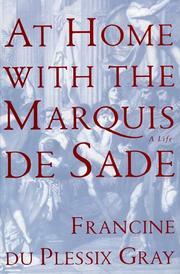 Now a very fine biographer has turned her attentions to Donatien Alphonse Franáois, Marquis de Sade (1740—1814). Gray is a woman of already substantial reputation as a novelist and journalist who established her credentials as a biographer with her excellent study of Flaubert’s lover, Louise Colet (Rage and Fire, 1990). Of course, many scholars have worked assiduously at Sade’s biography over the years, and Gray doesn—t claim to offer fresh discoveries. However, she can claim to offer fresh insight. The angle of vision she develops in her version of his life is that of Sade’s relationship with his devoted and loving and interestingly ordinary wife, PÇlagie, and their family. For his part, Sade seems also to have been devoted to PÇlagie, in his own odd way. Often prosecuted and publicly vilified for his sexual excesses (which are not nearly so bad as those he depicts in his fiction, but which remain sufficiently disgusting), Sade could always count on the support of his PÇlagie. The people who knew “Donatien” well, his biographer suggests, “detected a secret gentleness in him, something like a hidden stream of sweetness flowing through the heart of his being, which may well have been the secret of his terrible charm.” PÇlagie’s energetic husband will not win many admirers, but his life makes quite a story. Gray’s sharp and vivid prose, together with her skills as a storyteller, give this biography its edge over the scholars whose works have preceded it.